Do you remember watching 7 Up? I was at the libary today and found a DVD of 35 Up. I can remember watching 7 Up on the old black and white TV when i was growing up in the UK. It was very interesting to watch 35 Up and to see how they had all turned out. But what about now? The Up Series is a series of documentary films produced by Granada Television that have followed the lives of fourteen British children since 1964, when they were seven years old. The documentary has had seven episodes spanning 49 years (one episode every seven years) and the documentary has been broadcast on both ITV and BBC. In a 2005 Channel 4 programme, the series topped the list of The 50 Greatest Documentaries. This site is a collaboration between the Australian Maritime Museum and National Museums Liverpool UK. Telling the stories of the child migrants from leaving England and growing up in a different country. There is a message board on the website ,a good place to leave your thoughts or try to find someone. The Immigration Museum is in Melbourne, Victoria but you can browse through their extensive web site. Personal stories are told of people from all over the world who migrated to Australia. Britain, Western Australian's biggest international visitor market is declining and the number of British moving to Australia has dropped by nearly a third in two years. In the 12 months to November last year,13,190 people from the UK, Channel Islands and the Isle of Man permanently moved to Australia, according to the Australian Bureau of Statistics.Getting less cash for their pound,UK visitors are also choosing other destinations over Australia. With the cost of living so high in Australia many are having second thoughts about moving down under. To celebrate Australia day ,Ancestry.com.au is giving free access to all their Convict records. With one in five people in Australia who have a convict in their ancestry this is a very good opportunity. The records will stay open until the Sunday 29th January. Lots of information on this site to find your ancestors who were transported to Australia as Convicts.Fill in the form, for a bit of fun. Create your own convict. Baptism: 8 Aug 1850 St Peter, Liverpool, Lancs. This record is from the updated pages at Lancashire Parish Clerks. I have been researching this person. The information that i had on him was his name and that he was baptised at St Peter's Church. I have followed his path through all the census. This Blog is now 3 Years old . It started life as English Ancestors and when it grew bigger it became Your Ancestors Free. So what has changed over the 3 years? Well the cost to use sites like Ancestry.co.uk have certainly gone up in price.Their monthly world Heritage Package is now $59.95 for one months viewing. This is making membership out of reach for many now.Sites like Your Ancestors Free.Com are here to help you find your ancestors. You can also help others by recommending sites that you come accross.If you would like some help with some of your research,just leave a comment. Are you interested in finding out more about your Ulster Ancestors? A summer school,a joint project between the Ulster Historical Foundation and the University of Ulster will run from the 20th -26th of June 2012. Can anyone place this photo and the people in it. It was given to me by a cousin in Ireland. On the back it says 27 MAY 1931. My cousin said that her mother thought the photo was of the Laverty's. The Laverty. 's were my Grandmother, Elizabeth Laverty family. I have never seen a photo of Elizabeth but she could be in the photo. 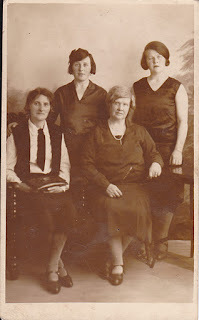 The lady second from the left would seem to be the most like my Grandmother from what i have heard about her. The Laverty,s were from Dunturk in County Down and were farmers. Please leave a comment if the photo looks familiar. Thankyou to Mary for sharing her family research. Family research can require hours of work. Sifting through old records. Bothering everybody and anybody. Phone calls to family for their bits of knowledge. And emails sent to forums, churches, newspapers and message boards. Always with the hope that you will find even one tiny clue to help connect the pieces of your family’s puzzle. And when you find a photo of an ancestor it’s a bit like manna from Heaven. Eureka! You weren’t expecting it but you had hoped for it. When it’s discovered you are so excited and appreciative. It has happened to me on a few occasions. But only because people shared with me. Recently I connected with a woman who was seeking information about her husband’s family that might be connected to mine. So we shared. She was so appreciative. Said that her husband had been very ill and was thrilled with this new information. It would give him something to read and absorb during his recovery.